Need another healthy lunch idea? 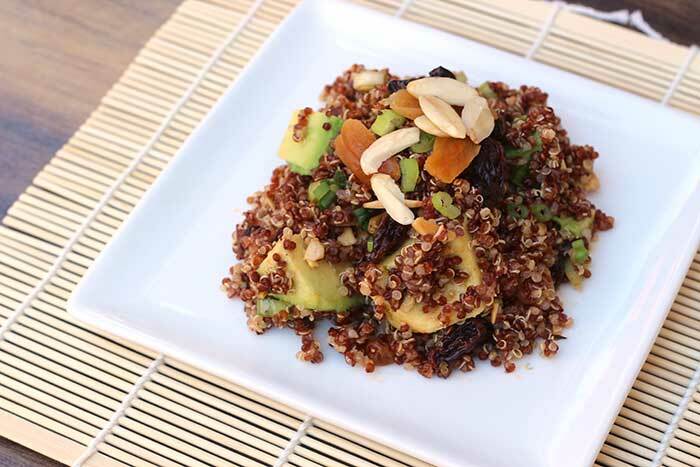 Try this quinoa avocado salad bursting with sweet dried fruit, creamy avocado, crunchy toasted almonds, and a tart lime dressing with hints of cumin and coriander. You can also reduce your portion size and serve it as a side dish with lean pork or chicken. Is it a sign of stress or old age when you go to the market, run a few other errands, and then completely forget to unload the groceries from the car when you get home? Maybe I was just too excited at the prospect of having this quinoa avocado salad for lunch. Once the quinoa is cooked, this versatile recipe is a snap to make. If you don’t have dried cherries or apricots, any combination of dried fruit will do. Try golden raisins, dried peaches, and craisins or anything else you happen to have in the pantry. If you don’t have a lime, use a lemon. If you don’t have almonds, use other nuts. (Pistachios would work exceptionally well.) Use either red or white quinoa, but keep in mind the red variety gives the finished dish a beautiful color. Once you try this recipe and decide you’re game for more quinoa, I have a few other recipes to share. After years of trying flavorless quinoa recipes, I’m happy to have stumbled upon several good ones. If you aren’t familiar with quinoa or haven’t cooked it before, start by reading my post about Patricia Wells’ Quinoa Salad with Spinach, Parsley and Spring Onions. It was the first quinoa recipe I really enjoyed. Quinoa Salad with Grapefruit and Avocado – This salad features grapefruit, mint, and pumpkin seeds. Quinoa Pilaf with Black Beans, Corn, and Jalapeños – Note this one is a bit high in carbs. You might want to reduce the portion size or use fewer beans or less corn. I can’t eat as many carbs per meal as I could when I posted this recipe! Roasted Cranberry Quinoa Oatmeal – Replace some of your morning oatmeal with quinoa for a boost of protein. In a medium bowl, soak the cherries, raisins and apricots in hot water for about 5 minutes. Drain and set aside. In a 2-quart saucepan, bring 2 cups water and the quinoa to a boil over high heat. Cover and reduce heat to low; simmer until water is absorbed and quinoa is translucent, about 15 minutes. Immediately fluff the quinoa with a fork and then spread it out on a baking sheet to cool. In a small bowl, whisk lime zest, lime juice, olive oil, coriander, cumin, paprika and salt. 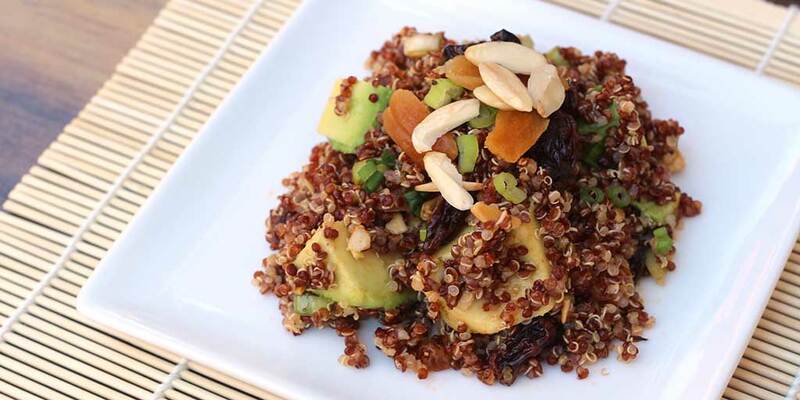 In a large bowl, combine quinoa (at room temperature), dried fruit mixture, avocado, scallions and almonds. Toss with dressing. Season with pepper. I’ve been looking for things like this to prep on Sunday and pack as lunch. This recipe looks fabulous!